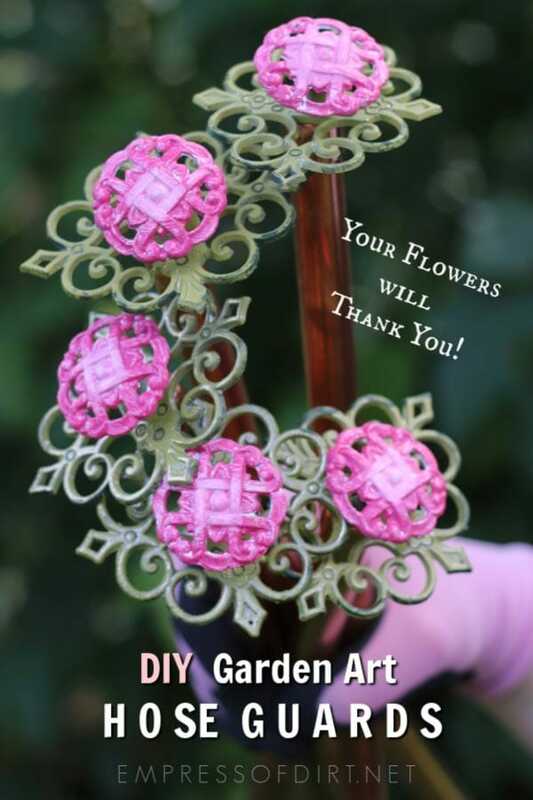 Hose guards prevent garden water hoses and electrical cords from crushing your flowers and plants in the garden. 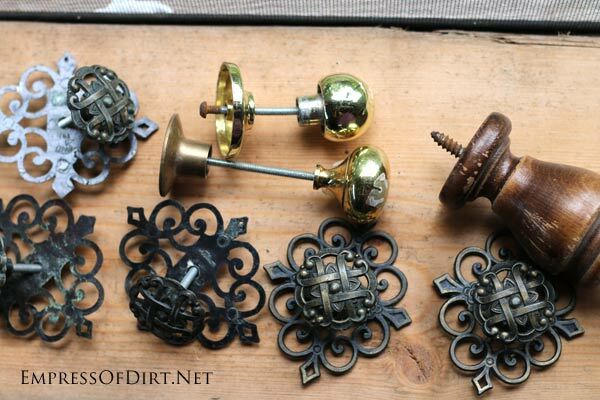 Made from thrift shop drawer pulls, these ones are frugal and easy to make. 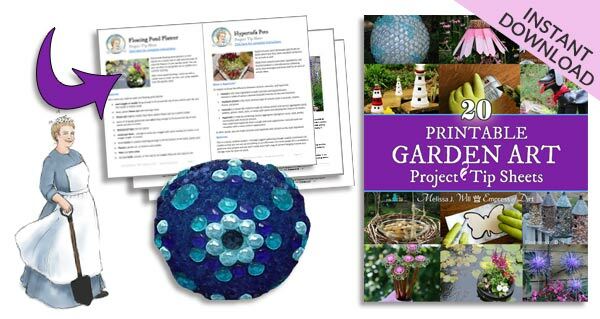 I’ll walk you through the steps for making a bunch for your garden. Your plants will thank you. 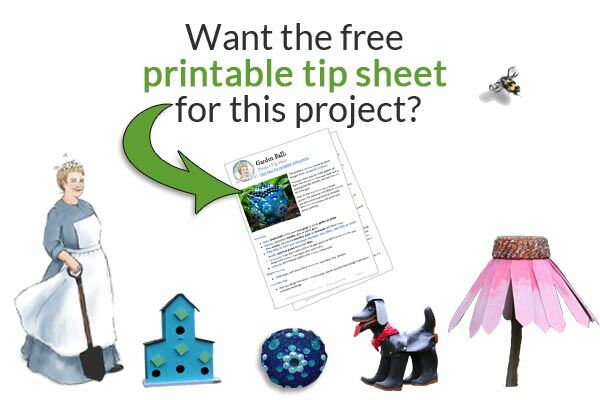 For more creative projects, see DIY garden art projects including garden art balls, a chandelier, and other thrifty creations. If you have an electric lawnmower or use garden hose for watering, you’ve probably crushed a plant or two while using them in your garden. I have a number of garden beds surrounded by pathways, and, without hose guards, I’m constantly having to watch out that I don’t crush plants each time I pull the hose (or cord). Homemade hose guards are a super simple way to stop the problem and really easy and frugal to make. In other words, you have no excuse but to spare your plants from further angst. 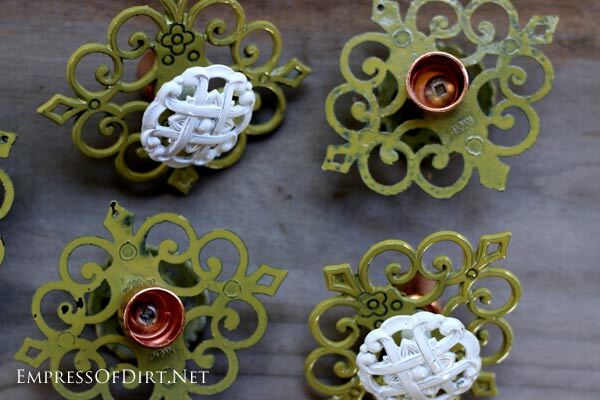 These ones are made from kitchen drawer pulls from the thrift shop. The best ones have a section that juts out, so, even if the hose rides up the pipe, the top of the hose guard will stop it from escaping. We want obedient hoses and cords, people. Some links go to Amazon.com via my affiliate account. I always recommend you shop locally and frugally whenever possible. 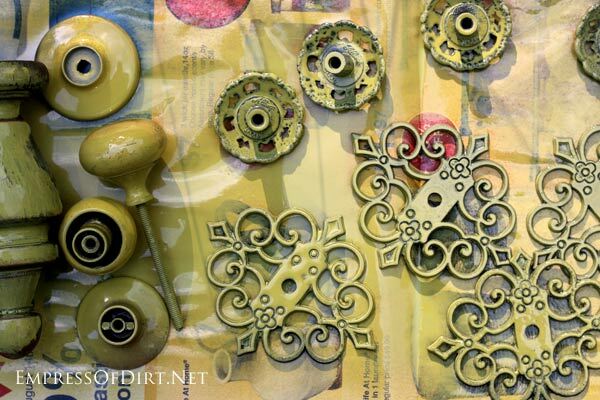 Drawer pulls with center bolts. 1/2″ copper pipe (2-3 feet long for each hose guard). 1/2″ copper pipe caps (one per hose guard). Bolts (one per hose guard) – you might reuse the existing bolts or need new shorter ones. Paint – spray primer, acrylic craft paints or spray paint in desired colours. Outdoor sealant – spray or brush-on polyurethane (to protect the paint). Paint supplies including protective cloth, gloves, mask, rags, washing up gear, and fine brushes for craft paints. Electric drill with titanium bit for making a hole in each copper pipe cap. 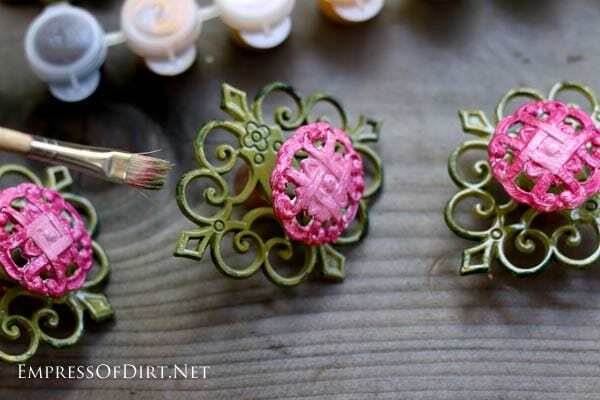 The drawer pulls I used looked like roses so I went with that idea. The leaves (lower section) were painted with green primer/paint. 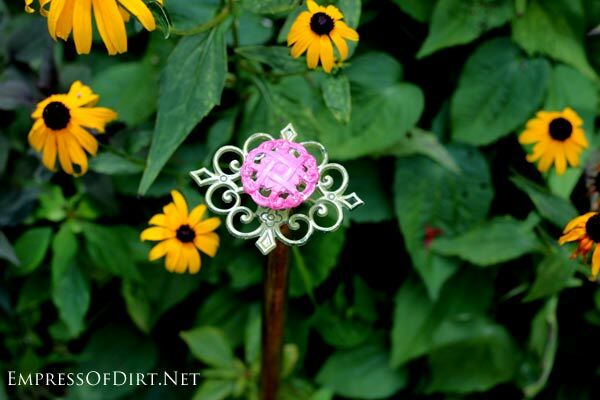 The flower buds were created with pink and white acrylics. 2. 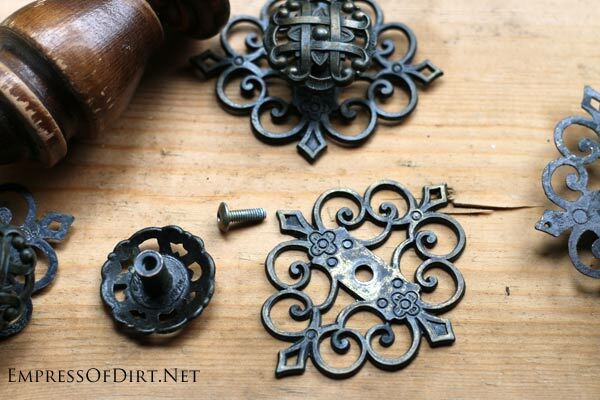 Clean the drawer pulls and take them apart. Set the bolts aside. 3. Spray with primer/paint. Allow to dry, turn, and other sides. 4. Drill a hole in the top of each copper pipe cap with a titanium drill bit, making it just large enough to thread the bolt through. It’s easiest with a drill press or vice holding the cap steady. You may be able to reuse the bolts that came with the drawer pulls or you may need shorter bolts (I did). 5. 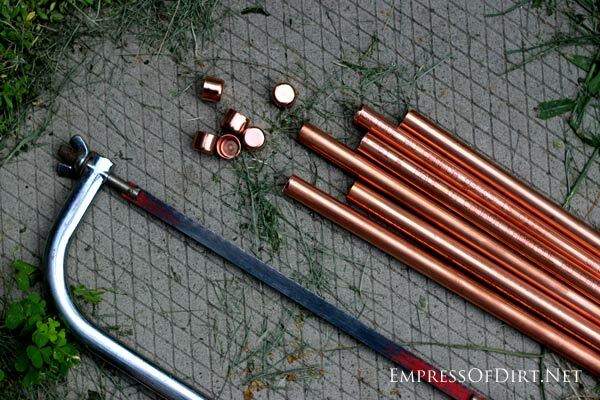 Cut the copper pipes to desired length. My pipes were 6′ long so I opted for three two-foot pieces. I would have preferred longer ones but I didn’t want to waste any pipe. SAFTEY NOTE: If you use a hacksaw, protect yourself and your work area. You’ll need safety goggles, gloves, a work apron, and a safe area to catch any copper bits that come off while sawing. These are very tiny and sharp. Clean them up before continuing your work. 5. Assemble the top of the hose guards. Thread a bolt up through one copper cap, reassembling the drawer pull. 6. Add any finishing paint touches. I painted the top of the drawer pulls pink and white. I also added some darker green paint to the edges of the lower section using acrylic craft paints to give them a little more definition. 7. For extra weather protection, add a few coats of outdoor polyurethane (comes in sprays or brush on). 8. To assemble, simply press the copper cap onto the pipe. It should fit snugly. If not, you can add plumber’s pipe adhesive. 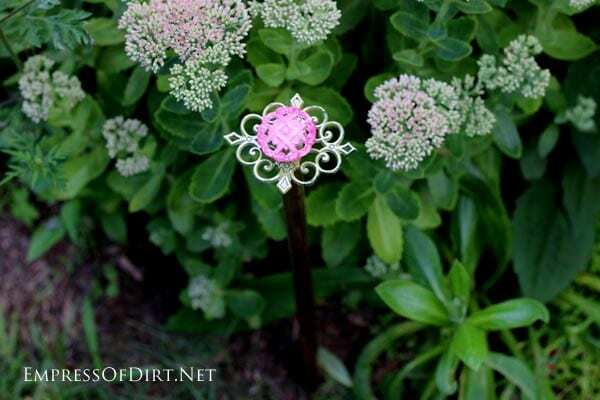 Add them to your garden wherever they’re needed. I put them at every corner and along some edges where the hose and cords can cause trouble. And if you’re stumped about what to give your beloved gardener for Valentine’s Day, keep these in mind. And then go by something he or she really wants, because the last thing I need is for my little hose guards named as the cause of your divorce. What a great idea! 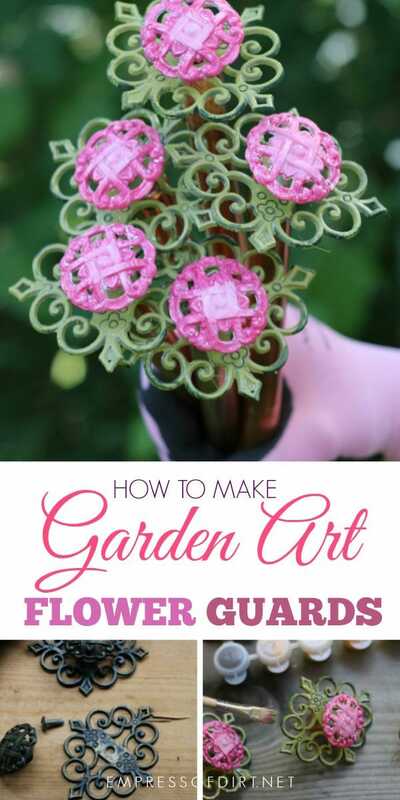 I am absolutely doing this as I have just planted some beautiful roses in my front flower beds. Could you please tell me where you got the square part? The part you painted green? I’m having a hard time finding anything that will work. The entire ‘rose’ was one drawer pull (came with both parts). I found mine in a second-hand shop and they came from an old set of kitchen cabinets. If you have a ReStore, that is a good source too. Good luck! At our cabin I had an extensive garden with many odd shaped beds. I spray painted some old bowling balls with silver paint and secured them beneath (in the finger holes) with chopsticks so that they would not roll away. Each spring they got a new spray of paint. It was a great way to enjoy the full moon as well, because on those nights of the full moon in the summer, the bowling balls simply shimmered in the moonlight! Would it be possible to use a glue like E6000 rather than drill a hole? I am not very good at drilling!!! I’ve made similiar hose guards with galvanised pipes and water faucet handles, etc. My grand kids have tried to turn the water on without much success, oops, so sorry. These are stunning – and helpful. I just love these! You are so creative and indeed an empress! 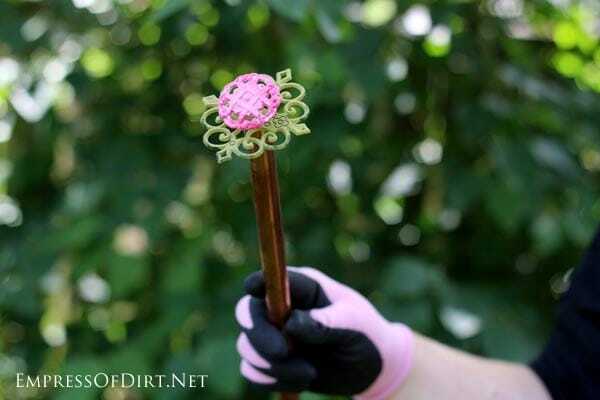 I love digging in the dirt and always get bummed out when the hose knocks over a flower or plant! Thanks so much. Is it OK to use PVC piping? Copper, pretty expensive stuff now days. Of course, use whatever you like. I had some copper leftover from a project so I used that. Is there a printable version? How can I print photos and directions without all the other stuff? I haven’t been able to find a solution from this end for easy printing without images. There are add-ons you can add to your browser to make it possible though. I hope to offer something in the future. Sorry I can’t be of more help. Darling…..what a clever girl you are. I want to make some of these! I love these, Empress! What a grand idea. I’ll be making some of these for sure. What lovely hose guards, Empress! Pretty and practical, too!